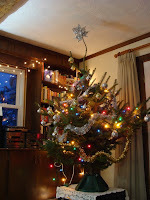 The decorations are all down now and everything's looking a bit bare, so I thought I'd decorate the blog to keep Christmas going until the last minute. I've always thought that this last day of Christmas would be an ideal one for a party: people often feel a bit low after the holiday and somehow the feasting and jollity never lasts the whole twelve days. I think that the retail trade is to blame for this - the shops certainly don't have any incentive to keep Christmas going past the 25th. Perhaps there should be an official Twelfth Night holiday to keep the festive momentum going for the traditional number of days. They certainly celebrated it properly this side of the Atlantic in the past. We've invested in a proper whistling stove-top kettle for the woodburner, which must be conserving a fair amount of electricity, the number of times we boil a kettle every day. It's also a very cheering sight in that rather dark corner of the kitchen. Outside, we've had another mild break in the weather and the snow is turning to slush again. I'm hoping that these melting periods are good news for the water table and for my vegetable and fruit plans. I've spent much of the weekend poring over seed catalogues and attempting to decide what we'll be growing this year. When I had two small raised beds I only ever ordered from one catalogue. Now I've got three catalogues (and one more due to arrive soon) and I'm a bit overwhelmed with choice. As I had to leave all my old seeds back in England, I'm starting from having nothing (apart from one packet of rocket and one of lettuce). My growing area is also so much bigger that I'm not so restricted in what I can grow: I've never grown potatoes or winter squashes before, for example. I'm also surprised by the considerable variations in price between the three catalogues, for the same seeds. One is American, one Canadian and one British. Usually the US and Canadian products are cheaper, but not always. I've ended up creating an Excel spreadsheet to track everything. I'm sure I'll end up ordering far too much, but hope that most of the seeds will keep for a few years at least, if I put them somewhere cold and dark. Somehow I suspect that I'll still be putting in an order in 2009, but maybe I'll manage to restrict myself to just the one supplier next year. If you can locate seeds for "Miner's Lettice" it grows all year round here in NZ South Island. Winters are cold but not as bad as yours. Thanks Sheila - I'll look out for that!